A vacuum flask or Dewar flask has the remarkable capacity to hold extremely cold liquids like liquid nitrogen for a considerable length of time. The boiling point of liquid nitrogen is 77K compared to a room temperature of about 300K. You can hold liquid nitrogen for about a day without even a cover on the flask! You might expect such a cold liquid to explosively evaporate on contact with air in such an open container. How does it manage this containment? Clearly, the flask is able to effectively block heat transfer from the outside either through the walls or through the open top. This is an active graphic. Click on any of the highlighted text for further details. So the cold nitrogen above the liquid occupies about one-fourth of the space it would occupy in the surrounding room- temperature air. 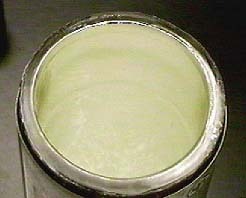 The dry nitrogen at about four times normal density forms an effective insulating "stopper" on top of the liquid.